The 1897 Mauve Egg, also known as Mauve Egg with 3 miniatures, was probably made of gold and mauve enamel. 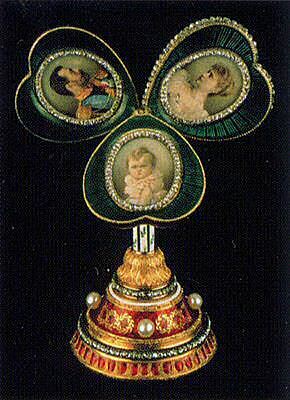 The heart-surprise is made of rose-cut diamonds, strawberry red, green and white enamel, pearls and watercolor, probably on ivory. 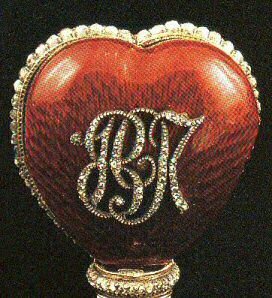 Research in the Russian State Historical Archives in Moscow shows that the surprise in the Mauve Egg was heart-shaped and there is a strong suggestion that it may be the heart-shaped frame included in the Forbes Magazine Collection, (now Vekselberg Foundation). The frame is set with the date 1897 in rose-cut diamonds and opens as a three-leaf clover with each leave holding a photograph, Nicholas II, Alexandra Feodorovna and their baby daughter Grand Duchess Olga. There is no mention of the Mauve Egg in either the 1917 or 1922 inventories of confiscated Imperial treasure. This suggests the Egg had been removed before 1917, perhaps by Maria Feodorovna herself. 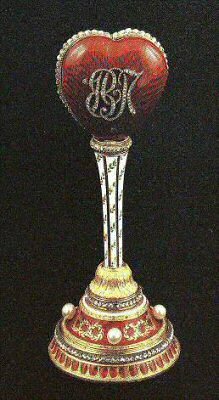 A Fabergé "ornament" was lent by Grand Duchess Xenia, daughter of Maria Feodorovna, in the 1935 Exhibition of "Russian Art" at Belgrave Square in London. The exhibition catalog mentions an "Easter Egg; miniature of Empress Alexandra and Grand Duchess Olga". Nicholas II was not mentioned. If this miniature frame is indeed the surprise from the 1897 Mauve Egg, the fact that the date is marked on the surprise and not on the Egg itself, could be an explanation why the "early Eggs" were not dated. It is possible that the surprises in those Eggs were dated. 1978 the heart surprise was sold by Christie's (Geneva) to the Forbes Magazine Collection, New York. 2004 Sold by the Forbes' family to the Vekselberg Foundation/The Link of Times Foundation, Russia.